Perhaps it's the brushed magnesium and aluminium alloy casing that gives it away, perhaps it's that sleek sliding action, but there's no doubt that the EL71 is first and foremost a style phone that's designed to turn heads. It's certainly a sleek looking device, especially in the shiny version that we got to try, although it's also available in 'opal black'. The squarish design gives off an air of seriousness, but that's all to the good - it may look pretty but the EL71 isn't just a catwalk cutie, and it's got a decent spread of midrange specs packed into its stylish casing. 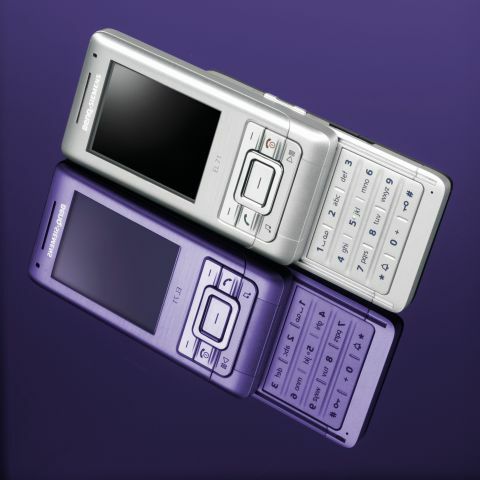 It's lightweight too, considering it's a metal-bodied phone, at 94g, and slim, at a shade under 17mm; it's no RAZR, but you shouldn't have any trouble concealing it in a pocket. The slider, as you might expect from Siemens' consistent excellence in this regard, is smooth and efficient and in the hand it feels just right. It sounds pretty good too, thanks to a range of changeable swooshy sound effects. The keypad automatically locks when the phone slides closed, although you can unlock it with a couple of key presses if you want to search the menus or activate the media player without opening the phone. There are two dedicated music keys on the front, which can be operated when the phone is open or closed. One gets you straight into the media player, the other can either play or pause and you can shift between music, pics and video using the direction keys. Volume controls are on the left side and there's a mirror image of these controls on the right - down for quick access to the camera, and up for a selected quick dial number. When you do get around to opening the phone though, you'll find that the keys are covered in a sort of rubberised plastic film, which feels quite pleasant to the touch, and certainly more tactile than the metallic style which might have been a more obvious fit with the metal casing. The blue backlight looks cool too. The bright 262,000-colour screen isn't huge at 41x36mm but it's big enough to display up to eight lines of text and it shows off pictures taken with the onboard 1.3-megapixel camera very well, with an impressive level of clarity. The graphic layout is easy to find your way around and looks as good as anything else out there. The 1.3-megapixel camera is the least you need on a midrange phone these days and this one doesn't disappoint. The lens has no cover but is embedded in a fairly deep recess that should protect it from most knocks and bumps. There's a mirror next to the lens as well as a flash, which can either be used as intended, flicking on only when you take a snap, or set as a torch for constant illumination. There's no multi-shot option, but there is a self-timer which can be set between five and 30 seconds, there are five resolution settings between low and premium as well as various lighting adjustments, but there are no onboard editing facilities - although you can transfer your pics to your PC using the supplied USB data cable or Bluetooth. The pictures look decent enough, although the usual flash issues apply - if your subject is more than a metre or so away, the flash might as well not be there. Video however was a little more problematic, with playback proving rather choppy, the picture sticking briefly at intervals. The video camera will allow you to record for as long as you have memory onboard (up to 16MB), or on the microSD card (up to 1GB are currently available). You'll need to remove the battery cover to get to it, but fortunately not the battery itself, so you can change cards while keeping the phone switched on. Incidentally, it hasn't yet been announced what size of microSD card, if any, will be supplied with the EL71 - this will depend on which networks take it up, or on special offers from retailers. The media player will play back MP3, AAC and AAC music files and MPEG4 video files which you can load using Bluetooth or the supplied USB data cable. The loudspeaker is fairly tinny, as you'd expect, but surprisingly loud. Further inspection revealed that the large speaker sits directly behind the metallic battery cover, and seems to use its reverberations to help project the sound. It cracks up at the highest volume, but it's a neat solution to the inherent problem of loudspeaker volume or lack thereof. Usefully, there's a music cable available, which allows you to plug directly into the analogue inputs of a stereo, so you can play back your music for all to hear, without having to rely on the tinny loudspeaker. You'll probably have to pay extra for it, though this hasn't yet been confirmed. The supplied headphones, as ever, could use an upgrade, but unfortunately there's no standard mini jack plug. There are two fairly decent games on board, with more Java titles available to download. NY Nights is an addictive little number that puts you in a Sims-style set-up as you arrive in New York as a fresh-faced yokel and do your best to make friends and influence people. Brick Challenge is a barricade breaking game with online multiplayer option. There's plenty of room for contact info, including four phone numbers, two fax numbers, two email addresses, two websites, full address, dedicated ringtone and even video ringtone if you like. Scrolling through the menus proved to be a bit slow and there seemed to be the odd lapse in logic regarding navigation. For instance, while you should be able to get around 100 hours of voice messaging on the internal memory, there's no fast key access to help you get those flashes of inspiration down quickly, and while in theory you should be able to programme one of the soft keys for this, we couldn't get it to work. The quick key button on the right which allows you to quick dial just one number is useful, but seems unnecessarily limited - wouldn't quick access to a list of favourite numbers have been more practical? Battery life seemed short of the claimed 300 hours standby and we found ourselves having to charge it almost every day we used it. The battery itself is a diminutive little fellow that takes up about a quarter of the phone's length, which may explain this.